I still don't know why publishers don't release games with inserts that will hold sleeved cards. This goes double for publishers who also produce sleeves (Fantasy Flight Games, I'm looking at you, here). Or when publishers just throw cardboard in there to provide a "channel" in the middle. One of my favorite entry-level games of the last few years is Deus. I've probably written about it before. 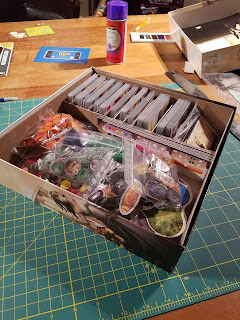 But the game's original insert will barely hold sleeved cards, and there is just no way that you can fit the base game and the expansion in there when both are sleeved. As much as I love the game, by the way, the expansion has done a ton to keep it from being the same/same. Either way, I got tired of hauling two boxes everywhere to play the game. So I bumped it to the top of my "to do" list for a custom insert. With the expansion, there are still six colors of card - but you chose before the game starts whether you're using the base game or the expansion cards for each color. Which means that I needed to keep the cards sorted, too. Twelve small (15-ish) cards decks of cards. 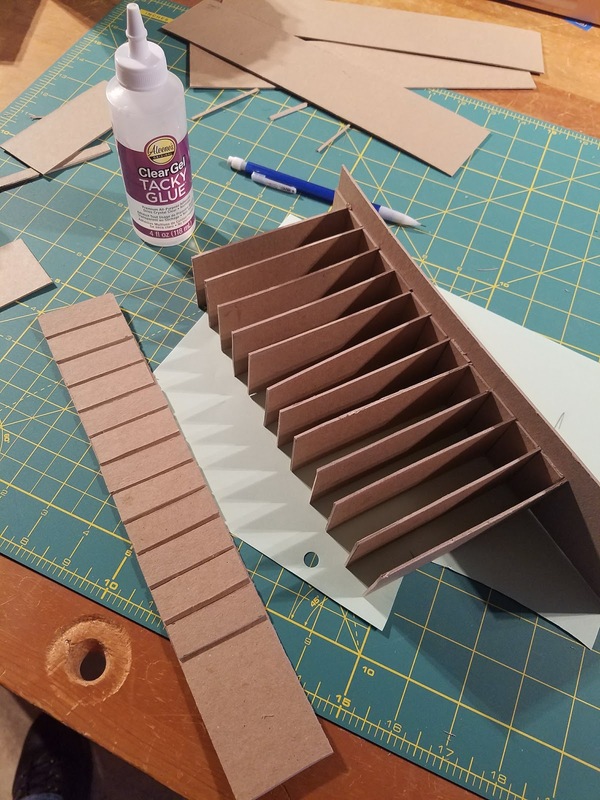 Which means a ton of foam core. Too much, actually. The stack of foam core needed to sort that many decks would have been almost as thick as the decks themselves, and there is no way I would have been able to fit the rest of the game in the box. So, even though it was at the top of the list, I had to backburner it. And then I saw this tutorial. 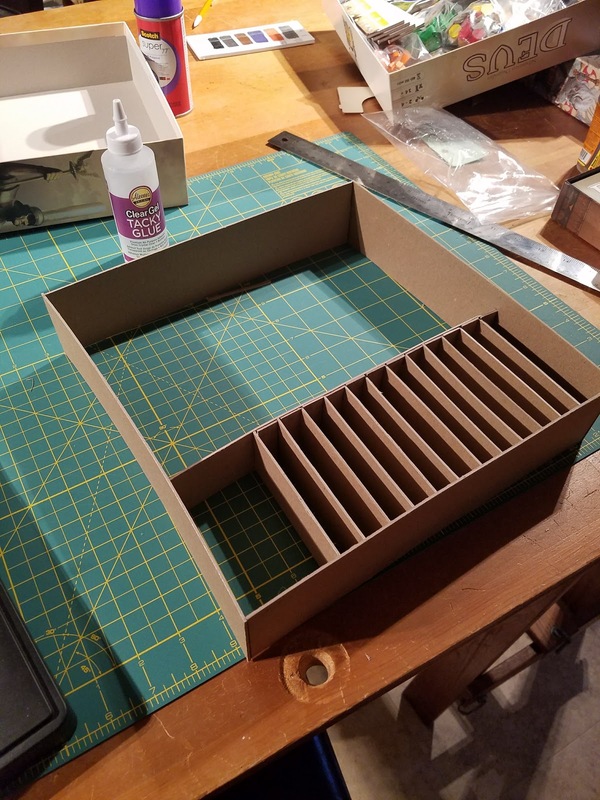 Yes, it's all about making boxes, but I reasoned that there wasn't any reason you couldn't use some of the same tools and techniques to also make inserts. 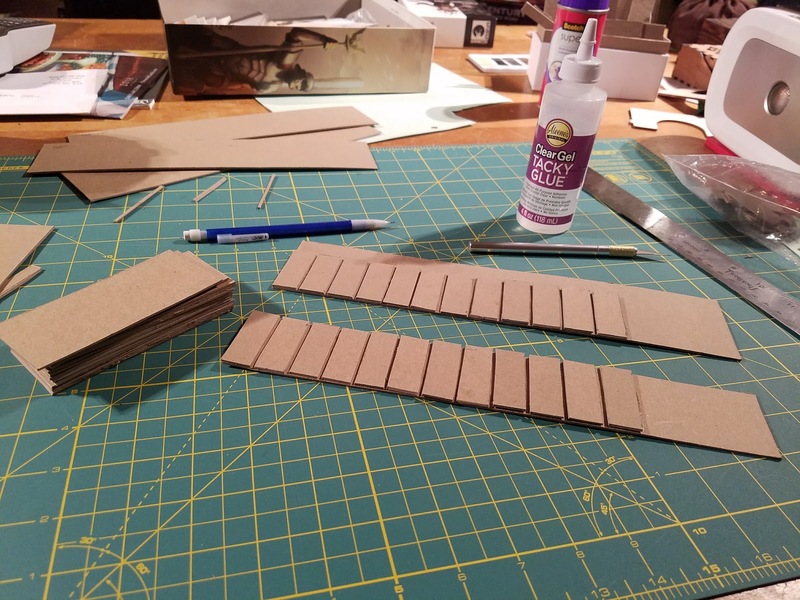 So I ordered some chipboard and some glue. I dug out my X-acto knife and ... realized just how much work this was going to be. Lining up twelve vertical dividers and then holding them while the glue sets would take hours. Or so I thought. Then I remembered that I know someone who could do this. Someone whose skills with such things is nearly unparalleled. My dad. I recently had a birthday. I don't really celebrate my birthday, but my parents do. So I asked them for a few hours of Dad's time. I explained that we'd be making box inserts and I roughly sketched out what I had in mind. I showed him the chipboard and the glue and my first few attempts at it. That weekend, he came by and we started work. I should tell you a bit about my dad. When it comes to crafting, my dad is one of the best. He draws, paints, sculpts, and sews. He does cross-stitch, reupholsters furniture, builds models, and designs jewelry. And it's not just "he does these things." He's good at these things. And that's just barely scratching the surface. He's terrifying. 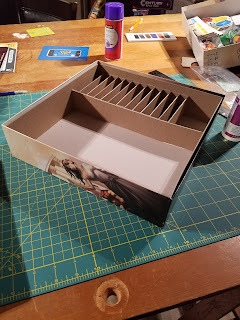 First we made a basic insert for Century: Spice Road (which is fantastic and you should all own a copy). 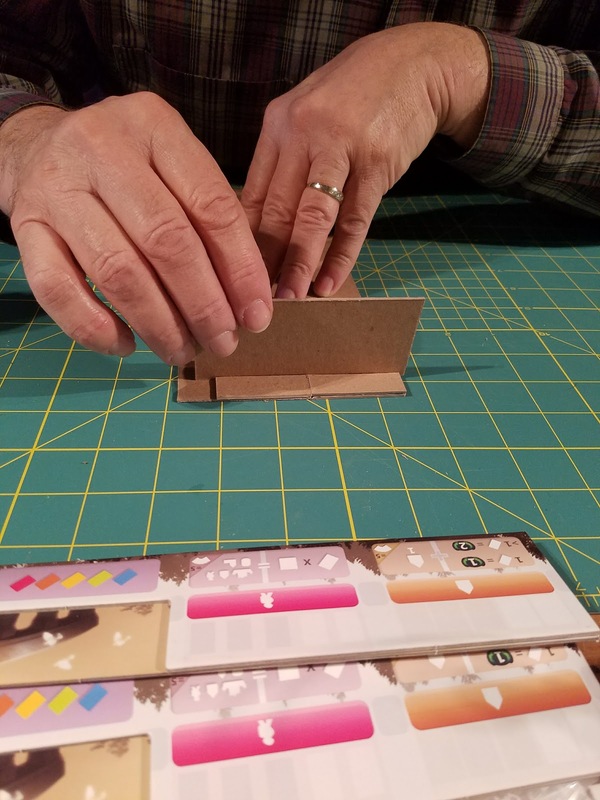 It was a pretty basic insert, but it familiarized Dad with what the chipboard was capable of. So I dug out Deus, and explained the problem. He grabbed some quick measurements and went right to work. "This is really good chipboard," he told me. "I would love to have had this when I was in college. Where did you get it?" "I like this glue," he told me. "You get that on Amazon, too?" He had to go before we were done, but his instructions were clear enough that I was able to continue the work the next couple of days. 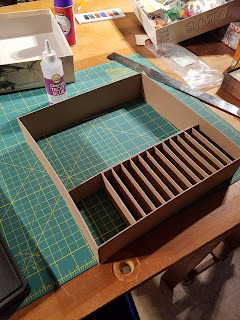 And, after less than an hour (not including dry time for the glue, it was starting to look like a game insert. And then: the acid test. "Will this fit in the box?" And is there enough room to hold everything? It was a win all the way around. I got a new box insert and reassurance that my techniques were good. I also got a few new techniques and ideas for future inserts. And, most importantly, I was able to spend time with Dad. 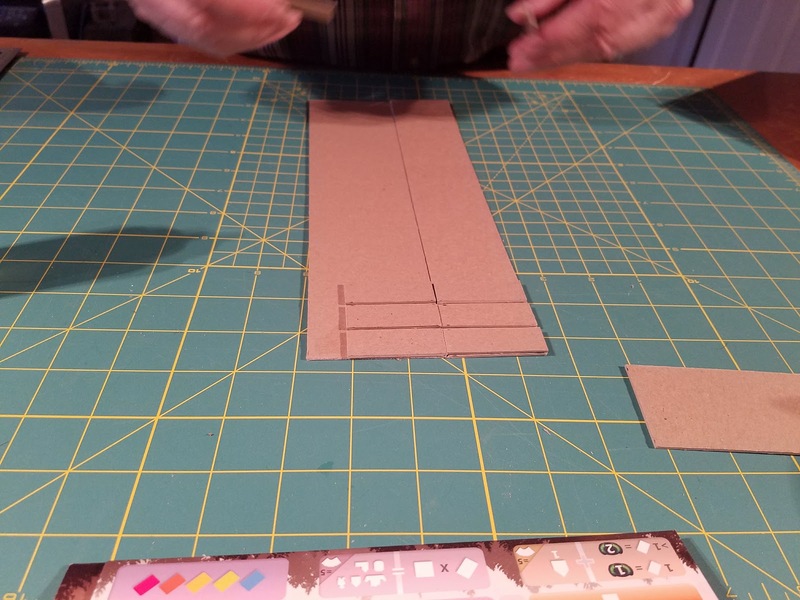 Dad got to work with his hands and do something for my birthday in a way that didn't make me uncomfortable about being the center of attention. Woot! Very cool! I dabbled with a few different sample tubes of Aleene's Tacky glue when I went through a pepakura phase some years back. 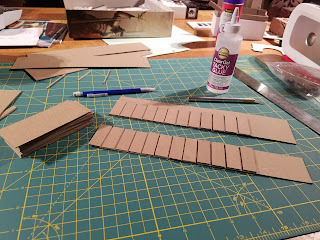 What worked best for all my paper folding needs was 'Fast Grab' Aleene's tacky glue. If you haven't given it a short I'd say give a little bottle a try.